1. What is ViewBag, ViewData and TempData in ASP.NET MVC? 2. How to use ViewBag, ViewData and TempData for passing data from model to views? In the previous chapter, you learned what is ViewModel and how to use it for sending model data to views. In this chapter, you will learn how to use ViewBag, ViewData and TempData for passing information from controllers/model to views. Before Starting this section, you must create following model classes and controllers. If you have already created it in the previous chapter then skip creating these models and controllers. ViewBag is a dictionary of objects and it is used for passing data from controllers to view. It stores values in a dynamic string property and you need to also use this string to retrieve values in the view page. ViewBag is used for only one-time request and once it populates the value to views it becomes null. If any redirection occurs, then also ViewBag value becomes null. There is no typecasting needed in ViewBag. Step 1: Go to ItemCommentsController.cs and add the following highlighted action method. 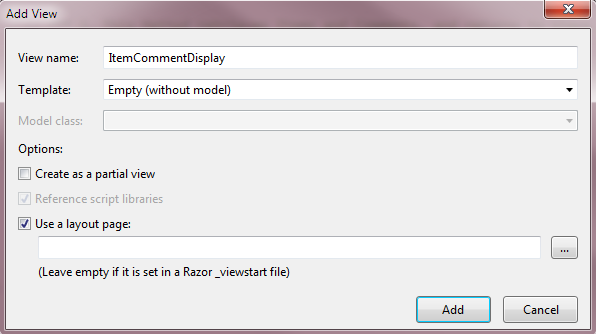 Step 2: Right click on ItemCommentDisplay() Action Method and create a View. 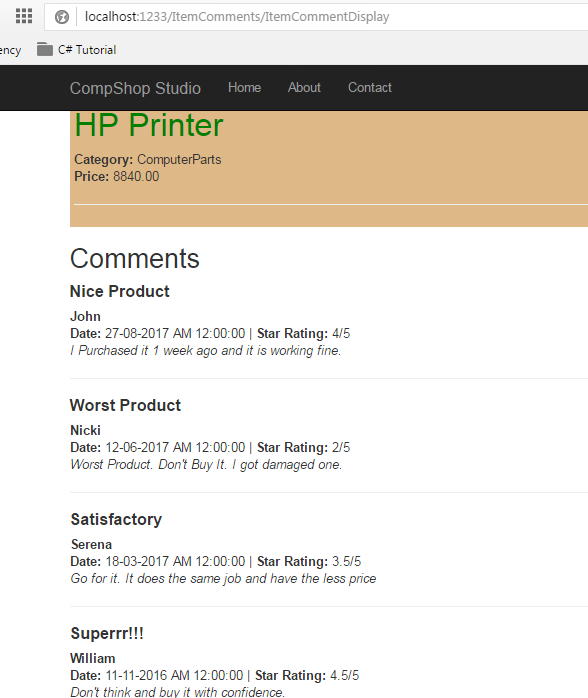 Step 4: Now, add the following code in ItemCommentDisplay.cshtml View Page. ViewData is almost same as ViewBag and it is also used for passing models/controllers data to view. It stores data in Key-Value pair and it is also available for current request only. Means, if redirection occurs then ViewData value becomes null. You must check for null and typecast complex data type for avoiding errors. Step 2: Go to ItemCommentsController.cs and change the ItemCommentDisplay() action method. TempData is also used for transferring Models/Controllers data to views but it provides more functionality than ViewBag and ViewData. TempData doesn’t become null when redirection occurs and it is accessible in two continuous requests. However, TempData is mostly used for displaying Error Messages and Validation Messages. You must check for null and typecast complex data type in order to avoid errors. In this chapter, you learned how to pass multiple models data to view using ViewBag, ViewData and TempData. However, there are also various ways to achieve this goal and in the next chapter, you will learn How to use Session to Pass Model to Views.